Last year, cancer biologist John McDonald made news with his lab’s development of a novel targeted therapy that eliminated ovarian tumors in limited, in vivo tests in mice. When his team’s ‘nanohydrogel’ delivered a payload of RNA to malignant cells, combined with standard chemotherapy, the results were dramatic, “the massive reduction or complete eradication of the tumor,” McDonald, a researcher with the Petit Institute for Bioengineering and Bioscience at the Georgia Institute of Technology, explained at the time. Essentially, the new nanoparticle-based treatment makes chemotherapy more effective. It’s the kind of research with a successful track record that national funding agencies tend to support. That’s exactly what happened in November, when the National Cancer Institute’s Nanotechnology Characterization Laboratory (NCL) gave McDonald’s lab a big boost in its research, which was accepted into the NCL’s quarterly Assay Cascade characterization and testing program. Each quarter the NCL accepts the most promising cancer nanomedicine candidates into the program. The nanomedicines then undergo a rigorous evaluation and testing, including in vivo studies to evaluate safety, efficacy, and pharmacokinetics. The other NCL awardees include researchers from Stanford University and the University of Utah, as well as the companies, EVOQ Therapeutics, Oncolmmune, Synergene Therapeutics, and ZY Therapeutics. The treatment McDonald’s team developed targets epidermal growth factor receptors (EGFRs), which are found in the epithelial cells that line the body’s organs. EGFRs spark a variety of functions in healthy cells, but in cancer cells they are overproduced. As a result of this overexpression, many cellular functions, including cell replication and resistance to certain chemotherapy drugs, are cranked up. An overabundance of EGFRs found in biopsy typically means a bad prognosis for a cancer patient. The new nanoparticle therapy uses a minute gel pellet to deliver short interfering (si) RNA, combined with the chemotherapy drug cisplatin, reducing resistance to the medication and shrinking carcinomas or eliminating them completely. The goal is to use the same nanohydrogel with other kinds of RNA to treat different cancers. Current law requires more trials to show the treatment’s efficacy before researchers can move onto preliminary human trials. So, while the treatment is still years away from clinical use, the NCL assist through the characterization program helps bring it another step closer to the bedside. 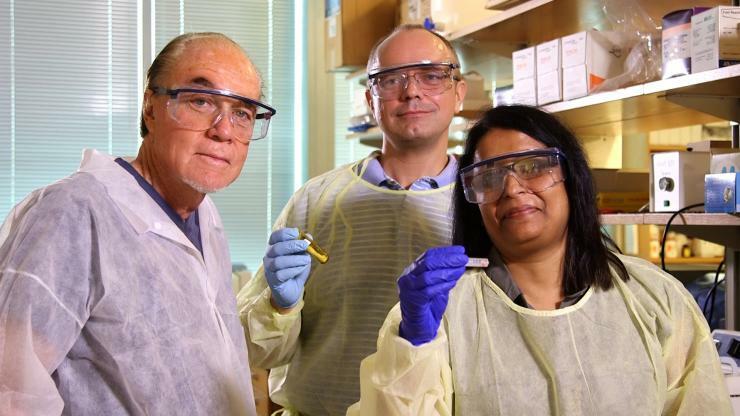 Ovarian cancer researchers (left to right) John McDonald, Roman Mezencev and Minati Satpathy in McDonald's lab at Georgia Tech.